Description: Early Christians in Asia Minor had to navigate the troubled waters of Roman social, political, and economic life while also preserving their faith. The church faced a double threat: Greeks and Romans viewed Christianity as a barbaric and potentially seditious superstition and, at the same moment, wealthy Christian benefactors, and their client teachers, were both perceived to threaten the integrity of the Christian community. 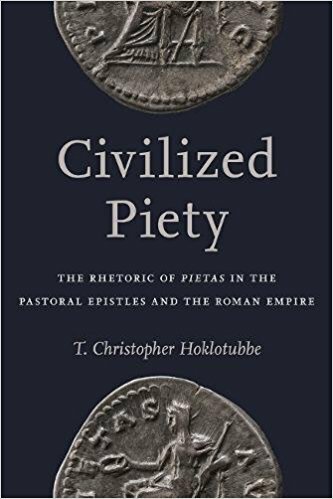 Christopher Hoklotubbe investigates how the author of the Pastoral Epistles (1, 2 Timothy and Titus) strategically appealed to the Greek and Roman virtues of piety (eusebeia, pietas) to ease these external and internal sociocultural threats. The Pastoral Epistles' rhetoric of piety―a term not found in the genuine Pauline epistles―becomes pointed when read alongside ancient discourses on piety from Roman imperial propaganda, civic benefaction/patronage, and moral philosophy. As Hoklotubbe demonstrates, piety was rhetorically potent in the efforts of the Pastoral Epistles to present the fledgling Christian communities in a compelling cultural light, as well as efforts to unite communities around a socially conservative vision of the household of God. Civilized Piety reveals the value of pietas within an ideological marketplace of emperors, benefactors, and philosophers, all of whom contend with one another to monopolize cultural prestige. The Pastoral Epistles, by employing a virtue so highly esteemed by forces hostile to Christianity, manifest a deep desire to establish good order within the church as well as to foster goodwill with the church's non-Christian neighbors. Citation: Mark Harding, review of T. Christopher Hoklotubbe, Civilized Piety: The Rhetoric of Pietas in the Pastoral Epistles and the Roman Empire, Review of Biblical Literature [http://www.bookreviews.org] (2018).